Chanté Torrane Moore, a daughter of Virginia and Larry Moore, was born on 17 February 1967, in San Francisco, California USA. Chanté is now a well-known R&B and Jazz singer, songwriter and finally an actress. Her first important step into a singing career took place when she became a background singer for world-famous Toni Braxton. In her overall career, Chanté has managed not only to become an award-winning artist, but also quite wealthy. So just how rich is Chanté Moore? Chante’s net worth has been recently estimated to reach $1.5 million, with her wealth having been accumulated mainly from recordings. With her father being a church minister, Chante Moore grew up in an intensely religious, but also musical environment, which actually influenced her career decisions. She is the youngest child of the family, having an older brother Kelvin and sister La Tendre. Chanté started singing in church in her early childhood, and decided to work in music industry while she was still in high school. Meanwhile, Chanté was also concentrated on modelling, taking part in various beauty shows and looking forward to building her career as a singer. Louil Silas, executive of MCA Records, noticed her when she was 22. This was the breakthrough moment for Chanté, as she debuted with her album called Precious in 1992, which not only went gold, but also got to the top 20 on gospel charts in the USA. During her singing career Chanté has successfully worked on and released a total of eight albums, with the last one showing up in 2013, which was awarded the “best independent R&B release” of that same year. Among her most famous recordings we can find Love’s Taken Over, Chante’s Got a Man and Straight Up. Moore is also the proud winner of eight awards and nominations with the first one taken early in 1992. Competing with Mariah Carey and Whitney Houston for the single of the year in the Soul Train Music Award nomination is as impressive as it sounds. Not to mention that Moore has twice been nominated for a Grammy. Being so dedicated to the singing industry has definitely paid off for Chanté, as she has accumulated her revenues during her career largely from her singing, as indicated by her current net worth. The personal life of Chanté Moore has always been a target for gossips. She has bee married twice, with both marriages bringing peak moments to her singing career. While married to her first husband, Kadeem Hardison(1997-2000), Chanté released one of her most successful songs called “Chante’s Got a Man”. She announced her fourth album Exposed in 2000, straight after her divorce from Kadeem. In the year 2002 Chanté married the American R&B singer Kenny Lattimore, another stroke for her career. The album “Things that Lovers Do” which was recorded and released by the famous couple ended up counting more than a million copies sold. This success, however, did not prevent the couple from divorcing later on in 2011. 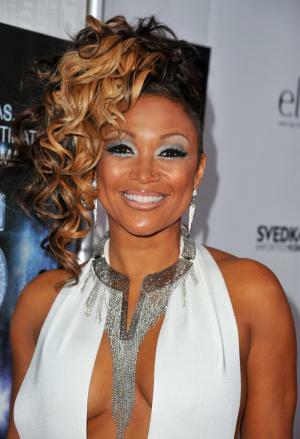 Chanté Moore has two children, a daughter and a son, one from each marriage respectively. Children Sophia Hardison, Kenny Lattimore Jr.
1 Niece of Fratis Green. 2 Mother of K.J. Lattimore. 3 Sister of LaTendre Moore. 4 Daughter of Larry Moore. 5 Ex-daughter-in-law of Bethann Hardison. 6 Hit top 20 on the Euro Hot 100 in 2000 with the single "Straight Up". 7 In 2000 her single "Chante's Got a Man" hit #2 on the Billboard Hot R&B Singles chart and #10 on the Billboard Hot 100 selling more than 500,000 copies. It was certified Gold by the RIAA. It was also nominated for Best R&B/Soul Single, Female at the 2000 Soul Train Awards. She was against Mariah Carey, Whitney Houston and Lauryn Hill. 8 Her debut single "Love's Taken Over" spent 33 weeks on the Billboard Hot R&B Singles Chart. It peaked at #11. Her other hits include "It's Alright" (#11), "Who Do I Turn To" (#83), "Satisfy You" (#48), "Old School Lovin'" (#19), "This Time" (#61), "I'm What You Need" (#56)," "Chante's Got A Man" (#2), "I See You In A Different Light" (#61), "Straight Up" (#23), and "Bitter" (#55). 9 She has sold more than 5 million albums and singles worldwide. Her 2003 album "Things That Lovers Do" reached #3 on the Billboard Hot R&B albums chart. Her other albums include "Precious" which peaked at #20 (R&B), "A Love Supreme" which peaked at #11 (R&B), "This Moment Is Mine" which peaked at #7 (R&B) and "Exposed" which peaked at #10 (R&B). 10 Baby boy, Kenny, born April 10 2003, with Kenny Lattimore. 11 Daughter, Sophia Hardison, with Kadeem Hardison. 2010 Soul Train Awards 2010 TV Special performer: "Contagious"
Two Can Play That Game 2001 performer: "Go Ahead With All That"
Romeo Must Die 2000 performer: "This Is a Test" / writer: "This Is a Test"
Shake, Rattle and Roll: An American Love Story 1999 TV Movie performer: "Wall Around My Heart"
Drive 1997 writer: "He Remembers She"
Waiting to Exhale 1995 performer: "Wey U"
Beverly Hills Cop III 1994 "Mood" / performer: "Mood"